I have done 3 scans never done this before and would love to see what others think and maybe some tips for better quality in the future. Any Feedback is appreciated. Remember I have never done this before my boss handed me and said try this and see how it goes. Not sure on your use case. I am assuming a website for cabin rentals. I would suggest that you use WP3D models for posting to the site. Many good options in that Wordpress plugin. As for the scans, I like the walkthroughs going outside! To make the dollhouses look a little better you could trim around the models and/or mark the windows to clean up some of the spray (stray pieces in the outlying regions) of the dollhouse. In one of the ones with the jacuzzi, I would rescan with the top on and then disable those scans in the walk-though. Water shows up as black in dollhouse views and makes it look like holes in the dollhouse. You may need to go back to where you cannot see the hot tub and start scans again. Just disable the scans with the top on the jacuzzi when you get into workshop after processing. 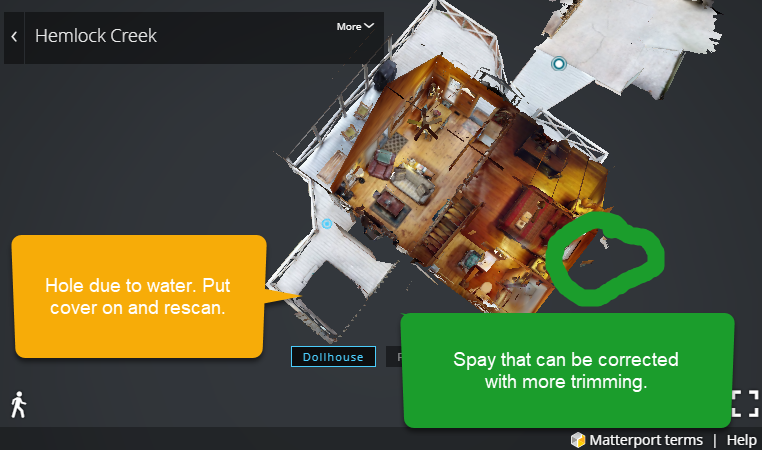 You can search for tags trim and find info on how to better trim the model for better dollhouse view. Overall good job! Just a few tweeks here and there.